Continuous-length paper labels can be cut to any size as you need, based on your Brother QL model, to quickly print small or large labels for a variety of applications. Its easy-to-use design installs and removes quickly to minimize your maintenance time. 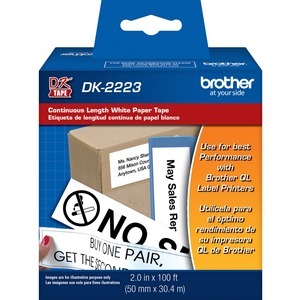 Paper labels are perfect for use on packages, binders, shipping items, shelves and more. Labels are designed for use with Brother label printers QL-1050, QL-1050N, QL-1060N, QL-500, QL-550, QL-570, QL-570VM, QL-580N, QL-650TD, QL-700, QL-710W, QL-720NW, QL-800, QL-810W and QL-820NWB (each sold separately).